At its best, the World Baseball Classic is a celebration of baseball as it has been played around the world. It was cool, then, to see Japanese home run legend Sadaharu Oh deliver one of the first pitches before Sunday's WBC semifinal between Japan and Puerto Rico. 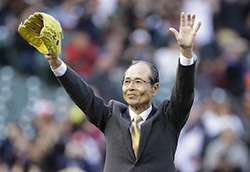 The 72-year-old Oh wore a bright yellow glove and basked in the cheers of a pro-Japan crowd at AT&T Park before delivering his throw.